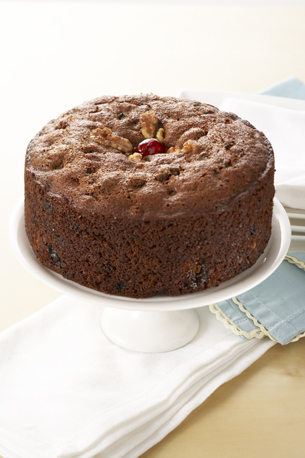 A McNally family fave (founder's of NUTTELEX), this cake is probably what your Grandma use to make at Christmas. It's too good to eat only once a year, however, and we suggest you bake it for your next picnic or hike in the country, and serve with a hot thermos of strong tea. Grate whole nutmeg on the finest section of a grater for a fresh flavour. 1Place NUTTELEX, sultanas, sugar, raisins, walnuts and water in a saucepan and bring to boil, stirring well. Remove from heat and cool. 2Sift flour and spices together and put to one side. 3Add bicarbonate of soda to fruit mixture and stir. 4Mix in beaten eggs then flour and spices. 5Pour into greased and lined 20cm cake tin and bake at 170°C for 30–40 minutes, or until an inserted skewer comes out clean. 6Cool in tin for 5minutes before turning out on a cake rack.